something of a franken-wankel in the next few months. And who doesn't love a good franken-wankel every now and then!?!?!? Bwahahahah, my guess is people who still have the ceremonial stick stuck. The engine harness came in a week or so ago, the underhood body harness came in earlier today, and everything plugs together peachy. Still need to sacrifice an OBD2 extension cable or get a connector from the junkyard, then I can start in on poking at the spare ECU with mazdaEdit. If I can't get the immobilizer stuff disabled, then I'll have to get a keyless entry unit and some other bits to trick it into behaving. 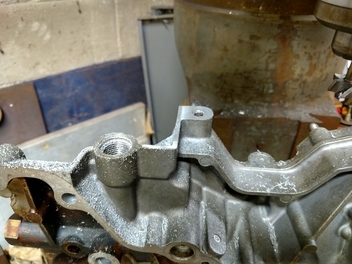 I also need to machine a 6mm thick spacer to use the RX-8 pulley hub on the RX-7 eccentric shaft. The trigger plate lines up with the ESPS on the front cover perfectly fine, but it seems the 8's had a shorter nose on the shaft. Without a spacer, I won't ever get a full clampdown on the hub, the e-shaft will end up floating, needle bearings will get destroyed, and I'll have big money pit problems. Plugging the new holes in the front cover is also on the agenda, as well as a redo of the dry sump plate to suite the new cover. I accidentally grabbed way more RX-8 guts than I should have when eBay had their 10% coupon last week. And then I went and got some stuff off Amazon. And then I bought socks. There are something like 14 packages showing up by next Tuesday. Got a steering column with the Advanced Keyless lock cylinder setup, a bunch of immobilizer/key/keyless module stuff to make the ECU happy, a throttlebody, accelerator pedal, 2" sch40 stainless weld elbows, a divided T4 flange gasket, a set of fuel injectors, and some other stuff I'm likely forgetting. There's been some progress on the front cover modifications as well, but I need to collect and process those photos before I can plop them up. So, yet more harness stuff, more sensors, a cluster, some keyless entry antennas, a few more programming tools, and a whole load of other nonsense. I'm reaching critical mass of parts. Something has to happen soon. Oh, yes, it is an entire cluster! The rest of the car harness stuff came in today, and I had it strewn across the floor to check things out. I've learned from my previous mistakes, this is all staying together, loomed up factory, till I go to install it all in a vehicle. No pre-strip of lighting, hvac, etc. I'll even keep the ABS stuff, because it generetes the VSS signals. The airbag wiring will be stripped at install time though. Not much changed, no real progress beyond what's already been made. I found a good deal on some 18.25x18.25" square sheets of 0.375" aluminum, and also picked up a 18"x18" 0.75" sheet. 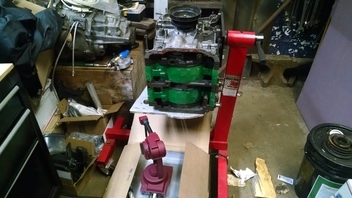 That's going towards redoing the dry sump as a CNC machined setup with integral scavenge pump mount instead of the plate-and-tube-mess I was going to make before. Should give me room for the A/C compressor to squeeze in above the scavenge pump. The plate needs to be reworked to accommodate the 13b-MSP front cover anyways, so that's the excuse I'm using. 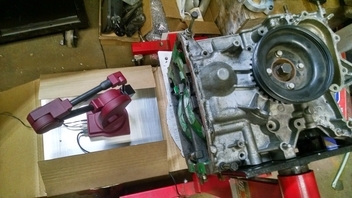 Then it's on to modifying the existing 13B-DEI intake to add in 2 extra injectors and the 6th port actuator assembly from the 13B-MSP, or modifying a 13B-MSP intake to fit the 13B-DEI keg. I'm actually leaning towards the latter down the road, but the former would be much quicker. All yesterday afternoon and into the night was a measurement fun-fest. Measuring arm on a sheet of 3/4" aluminum, on a GMC Sierra alloy rim, leveled with fabric scraps. Engine hanging limp on the stand, with just it's own weight and gravity keeping it from rolling around. Not the most stable reverse engineering setup, and it was sketchy as all getout straddling everything, but I now have all the point cloud data I need to do the dry sump pan. I also have the exhaust port locations, center iron engine mount stud/hole locations, and a few other miscellaneous bits of info that I needed to gather up. I'm getting closer to admitting that I need to machine my own pump stages in order to get the scavenge pump I have to fit the way I want it to. Once I nail down the pump placement, I can get the rest of the pan figured out and start cutting chips. A few photos from July, when I first swapped front covers. Had to mill down this ear to get things to fit on the engine stand. I think it's there for positioning/stopping the factory cooler line fitting from spinning, and to locate the A/C compressor. It's been a while since I've looked at it on a car. And now one from October. The 13B-MSP (RX-8) front hub and pulley fit, and the belts line up. 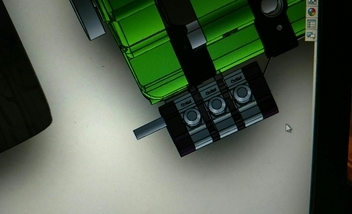 The shaft position sensor lines up as well. 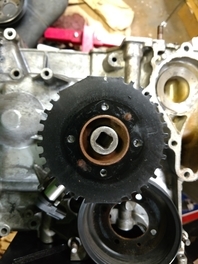 The 13B-MSP hub needs a spacer washer behind the main bolt to work with the older 13B-DEI e-shaft, since the shaft nose is few mm longer on the 13B-DEI. Thinking I'll make it a solid slug of aluminum, skim the hub ID, and slip fit it in with some 608 retaining compound. 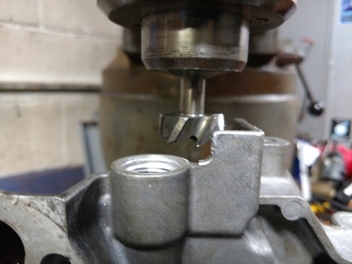 Then use the 13B-DEI bolt retainer as well for added peace of mind. 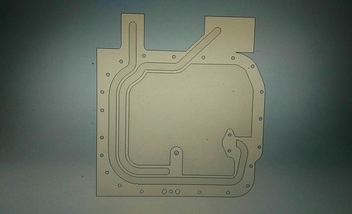 Quite a bit of CAD going on this week, in hopes of getting the dry sump system all fleshed out and ready to machine. 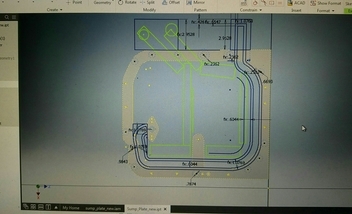 Picture quality is horrendous because I was doing the good old "Send a buddy photos of the computer screen from the phone while working on it. ", and didn't actually use screen capture/printscreen on the laptop. This was the top plate of the sump after the feed line for the factory oil pump in the engine keg was laid out. Oil flows in at the bottom left side, and is pulled through to what used to be the oil pickup tube flange. A very rough quick draw of the scavenge pickup channels. They're represented by the series of blocky green rectangles. The view as depicted is looking up at the bottom of the engine from the back of the vehicle. Think rolling under it on a creeper with the drivers side and transmission to your right. 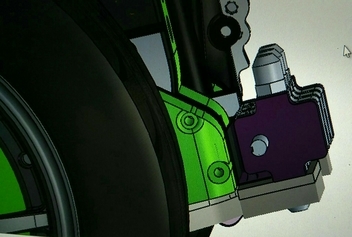 The pickup channels will have their slits at the bottom "L" feet so they catch oil when under acceleration. 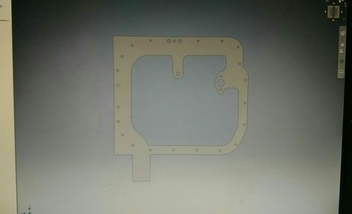 This is a top-down view looking "into" the lower plate. The main feed channel will have one continuous o-ring groove milled into the divider wall, and get some 518 anaerobic sealer when the time comes. Some mockups of the scavenge pump mounting to the plate stack. 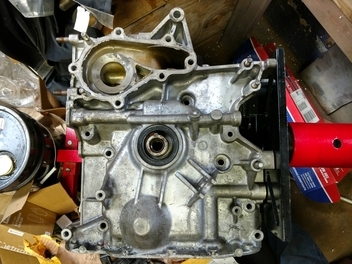 The plan is to bolt the pump rigid to the sump plate, and seal it with o-rings. On that note, I may end up using trimmed down VTEC gaskets to seal the pump down, since they have catch screens already molded in and are cheap-ish. 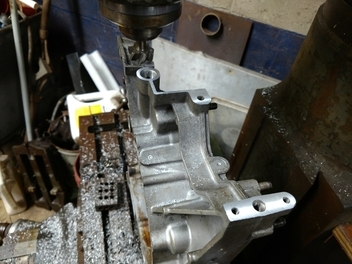 To do the bolt-on will require either machining the pump housings flat and removing the lower ftting protrusion, or making new housings. I snapped up another three stage Weaver pump off eBay yesterday to be the test subject for modifications. It's got an internally routed single scavenge outlet, instead of the twin outlets on my existing pump. It also came with a pulley and hub as an added bonus. I'm still on the fence as far as what to do with the third stage pressure section on these pumps. I could use it as circulation/cooler flow pump, cut it off and make it a scavenge only pump, or maybe even machine a lip seal carrier and use it as a transmission spray-oiler pump. I also snagged a used A/C compressor and line set so I can check fit on the dry sump pump and start in on designing the tensioner bracket to loop the serpentine belt around it. Since I'm still using the factory chain driven oil pump for pressure, I can get away with running the scavenge pump off the A/C serpentine belt. A/C compressor has to still fit, because I like creature comforts, and it will end up being part of the charge cooling system as well.